Jim Hayes is best known as a community leader for the www.MainstreetFairmount.org project to preserve the streets of Fairmount, Indiana. He is also a distant cousin of James Dean. What was it like growing up in Indiana as you did? I grew up during the 1940’s and 50’s when the country was at its zenith; good jobs were plentiful and the future bright. What kid wouldn’t want to grow up where the four seasons are spring, summer, fall and basketball? In my early years there were trees to climb, woods and fields to explore, western movies on Saturday morning with popcorn, coke and a Hershey bar. Carrying a pocket-knife to school was acceptable and every boy had one. As a teenager it was girls, drive-in movies, cool cars, drag racing and basketball. What’s not to like? Why did you feel compelled to go into civic work as you have? I guess the main reasons are Community pride and my interest in the preservation of historic places. Fairmount is unique among all cities and towns in Indiana and possibly the entire country. The thing that makes it unique is the high percentage of the population that has been listed in the Who’s Who in America. An article about Fairmount published in the Indianapolis Star on July 30, 1950, credited Fairmount with populating the Who’s Who at a rate that was 14 times the national average. At that time there were no less than 27 Fairmount natives listed, including best-selling authors, three college presidents, scientists, artists, business people, etc. And, there were 4 more in the pipeline; James Dean was still unknown, Jim Davis, the creator of the Garfield comic strip was 5 or 6, Phil Jones who was to become a CBS national television newsman and his classmate, Bob Sheets, destined to become director of the National Hurricane Center, were about to enter 9th grade. 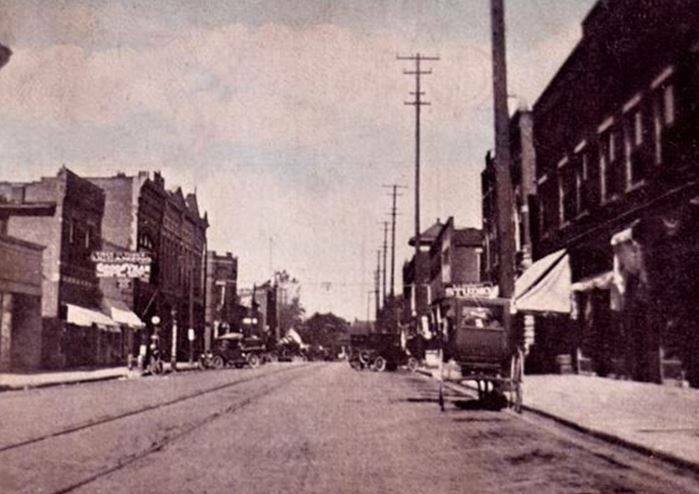 Why do you think it is important to preserve Main Street in Fairmount? How did that project come about? It’s both a matter of civic pride and the fact that Fairmount is an international destination for the millions of James Dean fans worldwide. Fortunately, there has never been an effort to turn the town into a James Dean theme park because the fans who come here seem to be looking for an authentic experience. They want to experience the town the way Jimmy did. I believe few if any are ever disappointed just based on the numbers of fans that return on an annual basis. Some even move here. I think the preservation movement began in earnest when a group of concerned citizens first established a Main Street organization a few years back. Can you tell our readers a little about your relation to James Dean? Jimmy and I shared the same great-great grandparents on his mother’s side (Wilson’s) of the family so we are distant cousins. Did you know his grandfather Johnny on his mother’s side yourself? What was he like? Yes. Johnny was a janitor at Evans school, which is the grade school that I attended in Marion; all the kids knew Johnny; He was quiet and seemed a little shy. Jimmy had his grandfather’s looks. My mother worked at the school too so I have several pictures of Johnny with the school staff. Did your family ever speak much of Jimmy or Mildred, what they were like as people? Not that I recall other than when Jimmy began to appear on television shows. I think we saw all of them. What do you personally admire most, from what you know, about the man who was James Dean, all fame aside? I would have to say his drive and dedication to achieve his dream. But beyond even that, is how he connects in a powerful way with young people from all over the world. It’s beyond understanding. What are your thoughts on the cultural fascination with him still? I find it fascinating that after 60 years young people are still obsessed with Jimmy. He cuts through barriers such as generational, racial, language, national, cultural, and religious like a razor and captivates the young. I can only think that he expressed so well the frustrations and confusion that all young people feel that they recognize him as someone who understands them at their deepest levels, and yet it ultimately remains an impossible to articulate mystery. All I know is that he connects with a vast audience in a powerful way. Jimmy’s fans from differing cultures, traditions, language groups and religions seemingly have a unique culture all their own.